There's plenty to see and do in and around Historic Downtown Seneca in 2019! Come visit us! Downtown Seneca comes alive with music & outdoor dining every Thursday April-October! Bands change weekly with different genres of music, so be sure to come by often! Bring a lawn chair and a picnic or enjoy great food and service at one of the downtown restaurants, many feature outdoor dining on Thursday evenings! Music starts at 6:30 but come early to check out the great shops and snag a table! 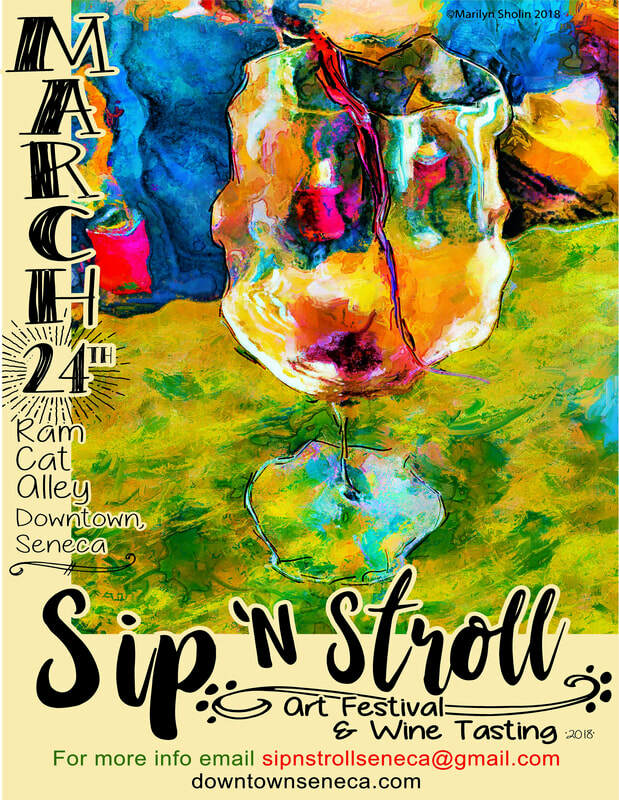 Sip n Stroll Seneca is an Art Festival and Wine Tasting event held March 30, 2019 betwen 11am-5pm on Ram Cat Alley in downtown Seneca. It features an arts and crafts show and wine tasting tent with live entertainment. The cost for the Wine Tasting is $10 for four tastings and will begin at noon. If you are interested in renting a booth to display and sell your arts and crafts, email, sipnstrollseneca@gmail.com for an application and instructions. The cost for an approximate 10x10 space is $50 and the deadline to submit is February 28, 2019 for committee selection. Sip N Stroll Seneca is an Art Exhibit and Wine tasting on Ram Cat Alley March 24, 2018 between 11am-6pm. The cost for the Wine Tasting is $10 for four tastings and will begin at 2pm. If you are interested in renting a booth to display and sell your art please email sipnstrollseneca@gmail.com for application and instruction. The cost for an approximate 10x10 space is $50 and the deadline to submit is February 24, 2018 for committee selection. 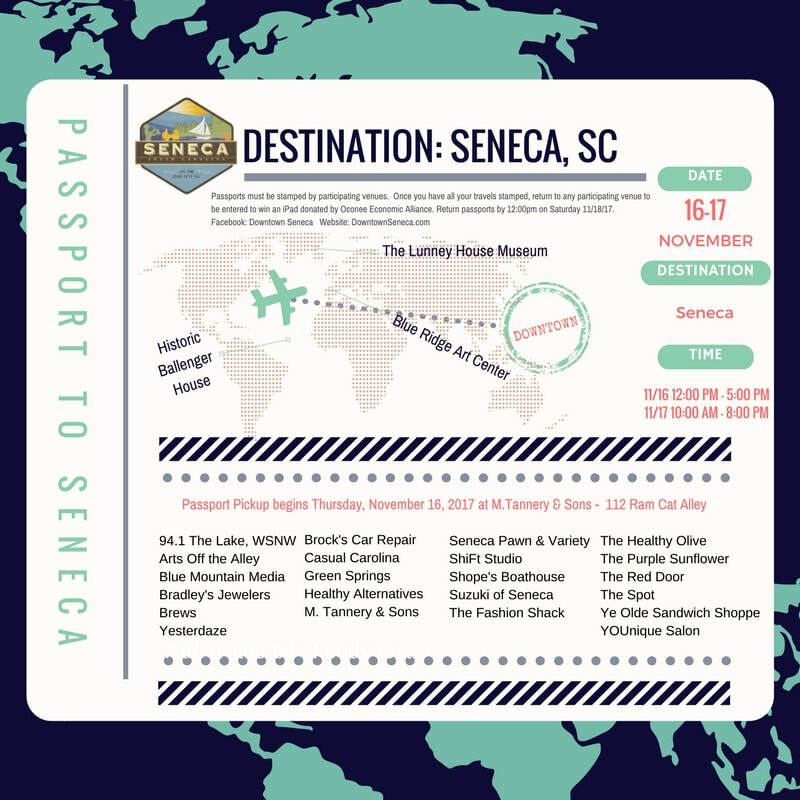 Passport to Seneca November 16-17, 2017! Open on Friday, Nov. 17th from 10:00 - 7:30. Opening Reception for “Celebrate Oconee” Art show from 5:30-7:30. “Seneca Cats on the Alley”. free original art created by BRAC Artists. 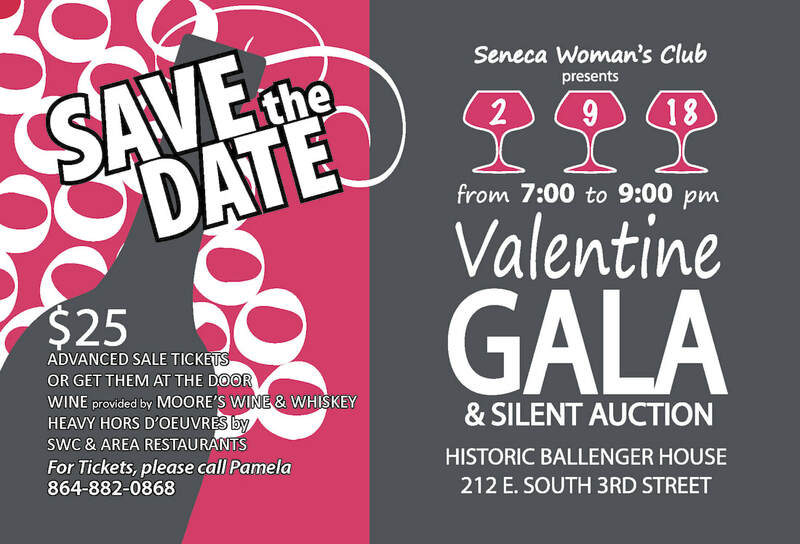 The Seneca Woman's Club & Blue Ridge Arts Center invite you to ARTS & ANTIQUES in Historic Seneca. Tickets ($10) will be available at the door of the Ballenger House and BRAC the day of the Tour, Saturday, Sept. 30th, beginning at 10 AM, the Tour lasts until 5 PM. 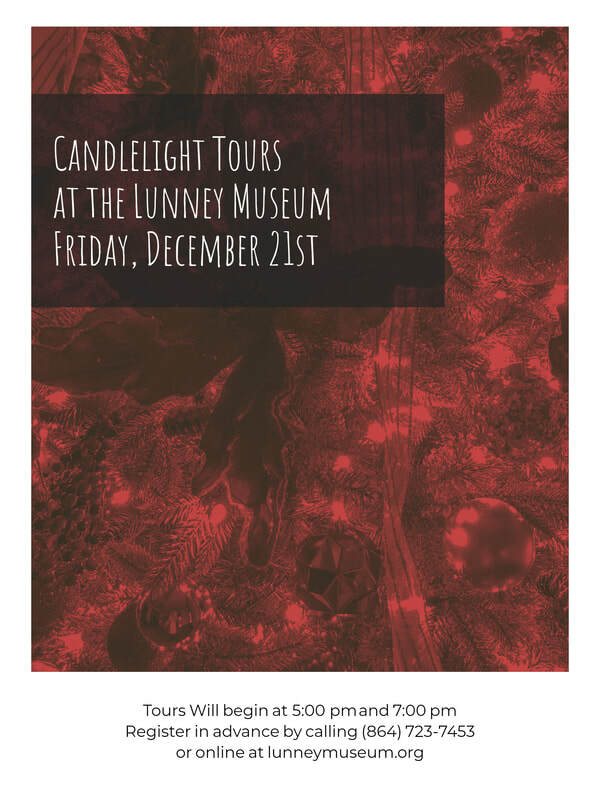 All are invited to attend a lovely opening "champagne" reception at the Lunney House Museum 6-8 PM on 9/29 and a closing reception 2-4 PM on Oct. 1st at the Ballenger House. 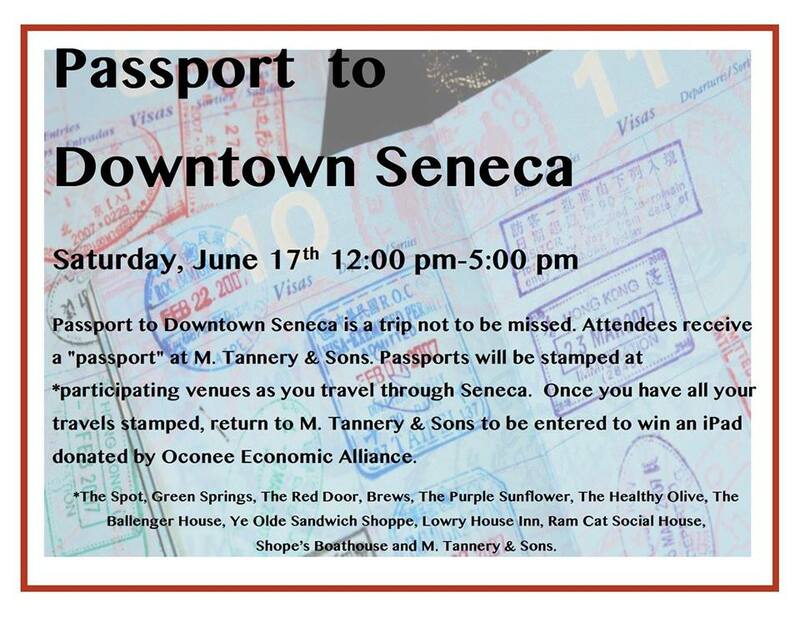 Mark your calendars for a fun event Saturday June 17th 12-5pm throughout Downtown Seneca. Attendees will receive a "passport" which they will get stamped at participating businesses.....you'll be surprised what you find and what you might just win! 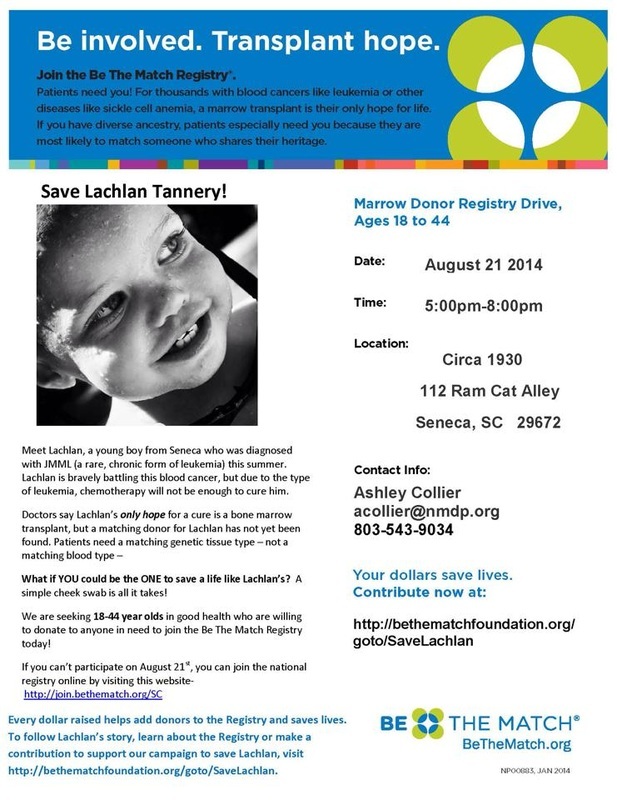 Follow the Ram Cat Alley Facebook page for more details! 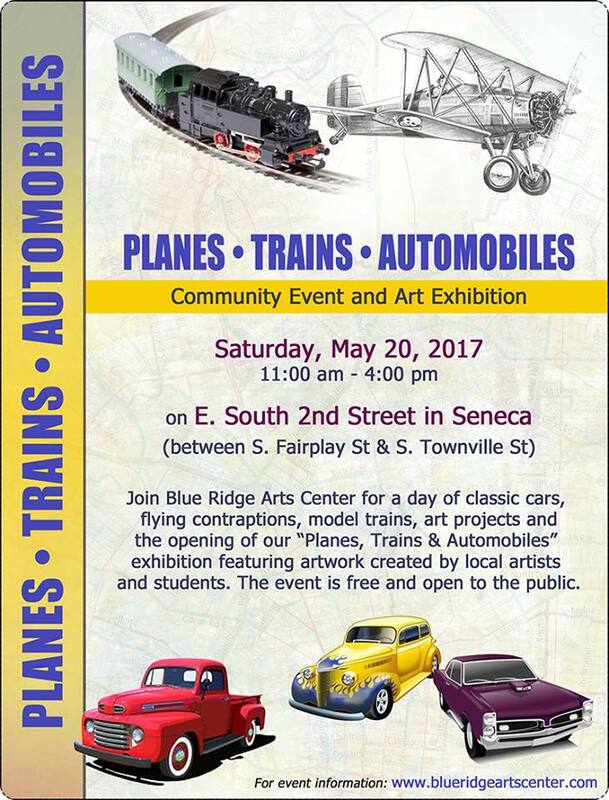 Be Downtown Seneca Saturday May 20th for Planes, Trains, Automobiles! This family friendly free event is open to the public and will be on E South 2nd street between Fairplay St & Townville St. Blue Ridge Arts Center is hosting a day of classic cars, flying contraptions, model trains, art projects & the opening of their exhibition featuring artwork created by local artists & students! Be there Saturday May 20th 11am-4pm! Seneca Fest is back for another round of fun in 2017! 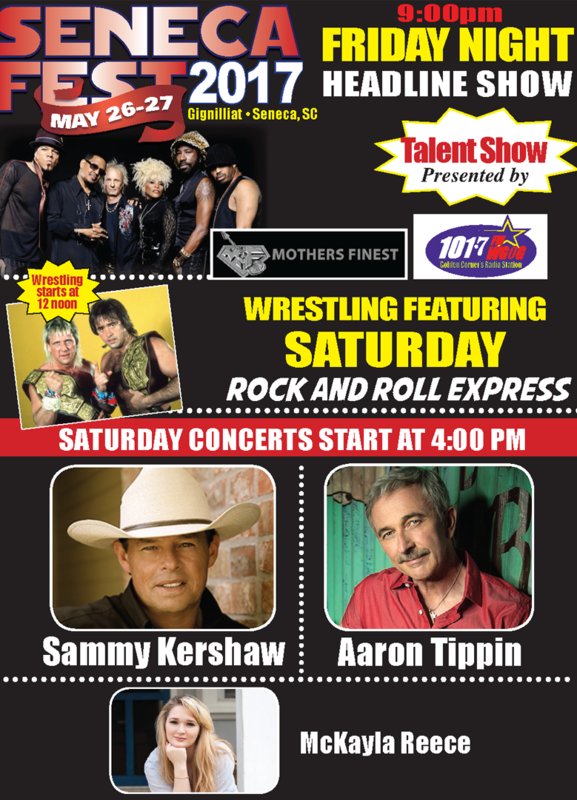 SenecaFest features a talent show, live music and wrestling, yes, wrestling! 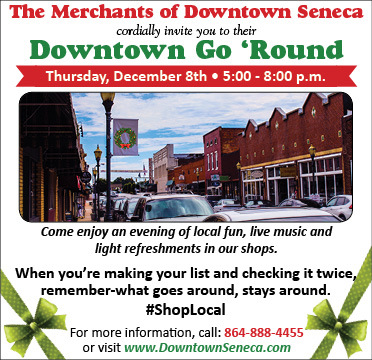 The merchants of downtown Seneca welcome you to Downtown Go 'Round! Come enjoy an evening of local fun and show some love for the local businesses! Stroll the streets and visit the shops for great shopping and complimentary light refreshments 5-8pm on Thursday November 10th and Thursday December 8th! Seneca JeepFest 2017 will be October 28 2017! Seneca Jeep Fest will be a fun day of wheeling, rides and general four wheel fun! Be sure to come on out to Seneca JeepFest if you love Jeeps, 4-wheeling or good family fun! Seneca JeepFest 2018 will be September 8 2018! A second year of Jeep fun in Seneca with Seneca Jeep Fest! In its sixth year, Jazz on the Alley is fun family friendly event in downtown Seneca! Live music, with rotating bands each week, entertain the crowd. Some visitors stroll the shops that stay open, window shop and get a bite to eat at the wonderful downtown Seneca restaurants. Some visitors bring a lawn chair and a picnic! Music starts at 6:30pm. SenecaFest 2016 is coming up! Seneca's Glo Run is at the end of May! 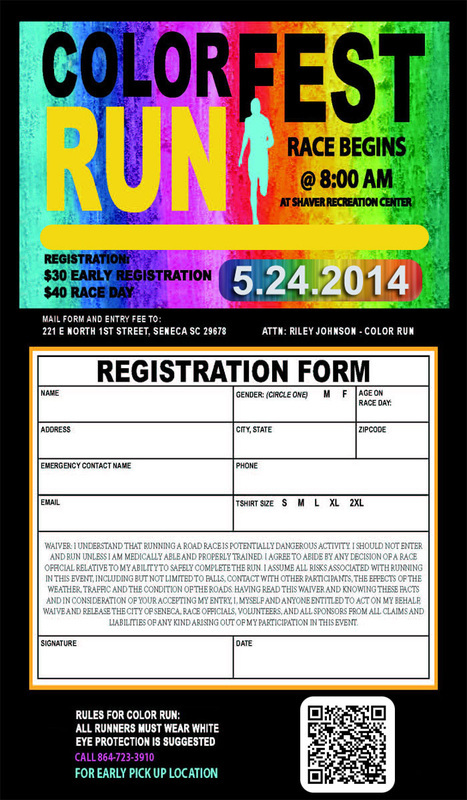 The City of Seneca invites you to its 2nd annual Glo run! Friday May 27, get glowing and come run at Shaver recreation complex! The party starts at 9pm and you may enter in advance or the evening of the run! Glo in the night run! Downtown Go 'Round is coming back! The Merchants of Ram Cat Alley are proud to welcome you to the RETURN of DOWNTOWN GO 'ROUND! The much loved event is back! Make plans to be on Ram Cat Alley from 5pm-8pm Friday November 6th 2015, February 5th 2016, and April 1st 2016! There will be live music and the stores offer light refreshments. It is a great time to come enjoy locally owned independent businesses; after all, what goes around, stays around! Shop local, dine local and enjoy an evening a local fun for Downtown Go 'Round! An exciting addition to the November 6th Downtown Go 'Round: Blue Ridge Arts Center is having a gallery opening, free to the public! The perfect merger between local art and local business--Downtown Go 'Round and Blue Ridge Arts Center's gallery opening! Brac's opening runs a little later than the Go 'Round, so be sure to check out both events--they're only a few blocks apart! For more information, check out Brac's announcement below! Downtown Seneca's Jazz on the Alley returns for another season of live music and family fun! This year's line up brings old favorites as well as new musical groups. Outdoor dining options have also expanded for 2015 to include Vangeli's and BBQ! The Spot is also open and serving outdoors (and indoors!). Many shops stay open for the fun evening also! Come out for Seneca's Jazz on the Alley every Thursday evening 6:30-9pm until the end of October! The final Jazz on the Alley for 2015 with be Thursday October 29th with Stone Echo playing! Downtown Seneca comes alive with Cruzin' on Main the first Saturday of every month! Come out for the fun 3pm-9pm! Come early to do a little shopping or catch lunch at one of the great restaurants! SenecaFest returns to downtown Seneca for May 22-23 2015! This year's festivities include a Glow Run on Friday May 22nd from 5pm-10pm at Shaver Recreational Complex and the headlining band with be Jefferson Starship with special guest Stone Echo! All events are free to the public! Come downtown Seneca Friday May 22 and Saturday May 23rd for a ton of fun! December 1st: The Seneca Christmas Parade is always a fun family oriented event. Weaving throughout downtown Seneca, the Seneca Christmas Parade allows kids and adults alike the thrill of a small hometown parade--candy, marching bands, cars piled up with revelers and of course jolly old Santa Claus! 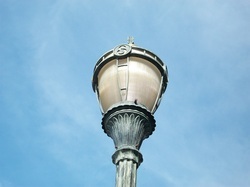 Come early for a little window shopping or stroll into the fabulous market place of downtown Seneca. Visit the merchants and vendors and enjoy a great evening of local splendor! Fire twirlers, fire jugglers, fire hula hoopers (yes, its a thing! ), a fun free photo booth, artist demonstrations, a caricaturist doing free sketches, food, drink and more great entertainment will dazzle you at this year's Spring into Downtown Seneca! Historic downtown Seneca welcomes you to this family friendly free event which showcases the wonderful businesses of historic downtown Seneca! **RESCHEDULED!! **Mark your calendars for Saturday December 14th (new date!) --come shopping downtown Seneca and then prepare to meet Santa from 5-8pm! There will also be train rides for the kids and a car cruise in for all to enjoy! Seneca's Annual Christmas Parade will be Monday December 2nd in downtown Seneca! This is always a fun, family friendly event! Put on your mittens and jacket and come on out! Historic downtown Seneca welcomes you to visit the stores Friday November 15th from 5:00 to 8:00pm. Stores will be open with complimentary food and drink as well as door prizes and give aways. This is a family friendly event! We believe in the importance of small, locally owned, independent businesses. Shop, dine & play local. It matters.